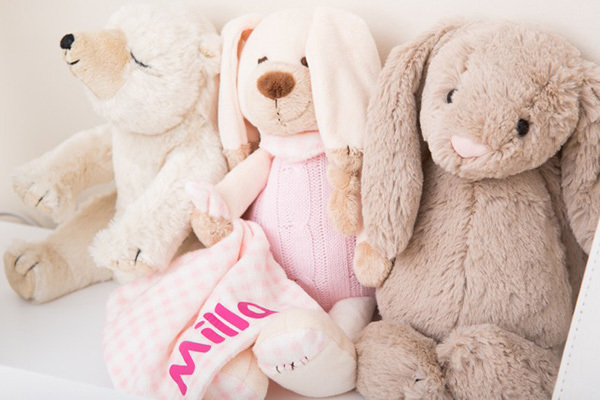 It’s sweet, it’s serene and it’s all things perfectly pink for Milla’s stunning nursery! Many mothers of daughters will understand that when you find out you’re having a girl, it can unleash some sort of drive to buy all things pink. Tracey had a definite idea of the colour palette and look she wished to create for such a special space and set about finding the perfect pieces with gusto. Tracey writes: As soon as I found out I was having a baby girl my creativity and styling ability came into full swing. I knew what I wanted and spent most of my days (and waking hours) sourcing all things nursery! As long as the items were white, pink and beige of course. I wanted it to look girly, pretty, calm and classy. No bright colours for this room! 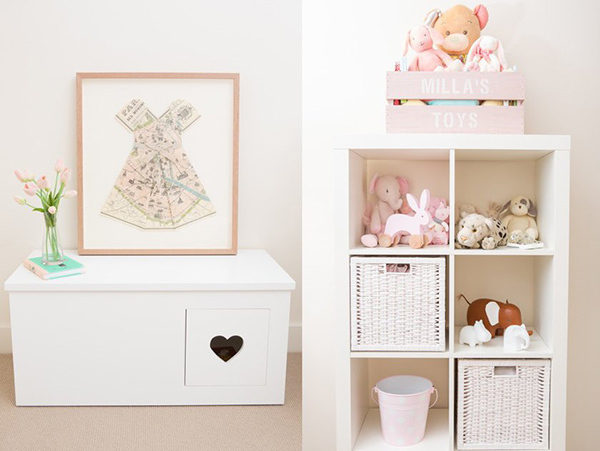 Working in fashion and having a finger on the pulse of what’s on trend and what’s classic and timeless, Tracey embraced the challenge of kitting out her nursery and then bringing the pieces to work together with beautiful personalised accessories. Tracey comments: As fashion product development was my background, it was my greatest joy to be designing a nursery for my very own baby! I have a passion for hunting, gathering and styling. It puts such a smile on my face every time I walk into Milla’s nursery and is such a joy when people see it and say “wow”. 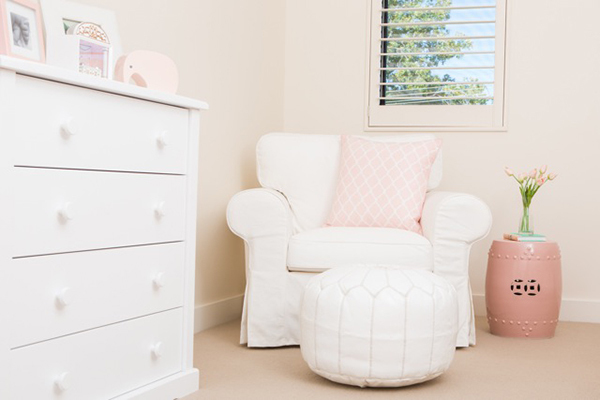 Storage goes a long way in a child’s room and we see that Tracey has that issue well and truly covered – a generous chest of drawers is ample space for a baby’s wardrobe and wicker baskets in the ever popular Ikea Expedit is a fantastic option for storing excess nappies, large baby sleeping bags, toys, shoes – all those things that need to go somewhere – neatly. The warm hued colour palette is not at all overpowering, Tracey has done a magnificent job of keeping it light, evening out the pink playing field with white and beige for an elegant edge. 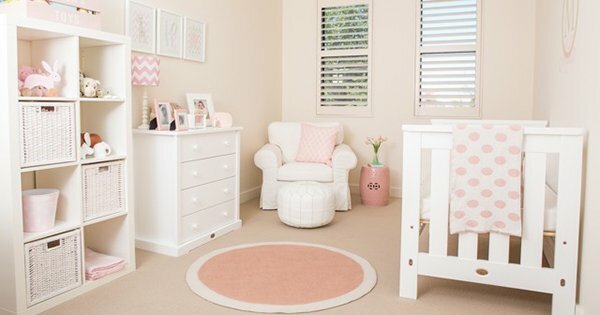 While it’s easy to see this beautiful room is fit for a new princess, it’s a space where you can easily swap the cot and change table for a single bed without having to alter anything else. The stunning oversized armchair and ottoman beg to be used for a quiet feed, a cuddle or story time – a perfectly chosen inclusion for the space. Personalised toy crate on top of Expedit – The Bushel Box Co.